This artist's conception portrays two neutron stars at the moment of collision. Such collisions produce rare heavy elements, including gold. 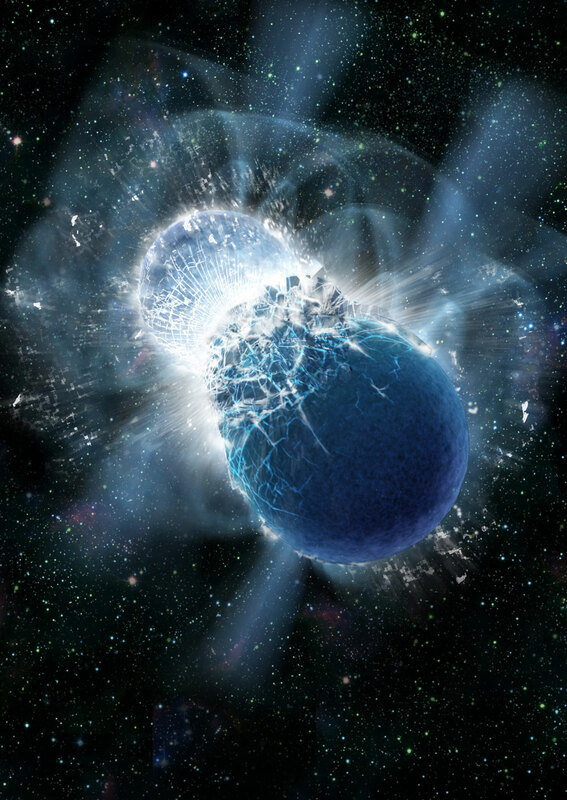 All Earth's gold likely came from colliding neutron stars. We value gold for many reasons: its beauty, its usefulness as jewelry, and its rarity. Gold is rare on Earth in part because it's also rare in the universe. Unlike elements like carbon or iron, it cannot be created within a star. Instead, it must be born in a more cataclysmic event - like one that occurred last month known as a short gamma-ray burst (GRB). Observations of this GRB provide evidence that it resulted from the collision of two neutron stars - the dead cores of stars that previously exploded as supernovae. Moreover, a unique glow that persisted for days at the GRB location potentially signifies the creation of substantial amounts of heavy elements - including gold. Edo Berger presented the finding today in a press conference at the CfA in Cambridge, Mass. Instead, the glow behaved like it came from exotic radioactive elements. The neutron-rich material ejected by colliding neutron stars can generate such elements, which then undergo radioactive decay, emitting a glow that's dominated by infrared light - exactly what the team observed. The team calculates that about one-hundredth of a solar mass of material was ejected by the gamma-ray burst, some of which was gold. By combining the estimated gold produced by a single short GRB with the number of such explosions that have occurred over the age of the universe, all the gold in the cosmos might have come from gamma-ray bursts. The team's results have been submitted for publication in The Astrophysical Journal Letters (see "Smoking Gun or Smoldering Embers? A Possible r-process Kilonova Associated with the Short-Hard GRB 130603B"). Berger's co-authors are Wen-fai Fong and Ryan Chornock, both of the CfA. Headquartered in Cambridge, Mass., the Harvard-Smithsonian Center for Astrophysics (CfA) is a joint collaboration between the Smithsonian Astrophysical Observatory and the Harvard College Observatory. CfA scientists, organized into six research divisions, study the origin, evolution and ultimate fate of the universe.